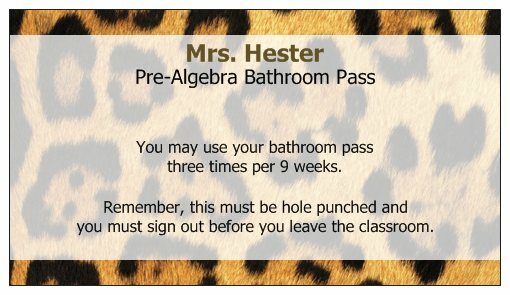 Like many teachers I've jumped on the VistaPrint bandwagon. Here are my latest freebies! Well, this is advertised as a car magnet, but who says I can't stick it to my classroom board or filing cabinet instead of my car?? 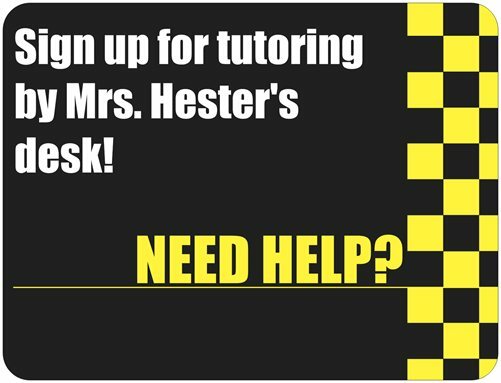 It is a nice little reminder to students that I am here to help. 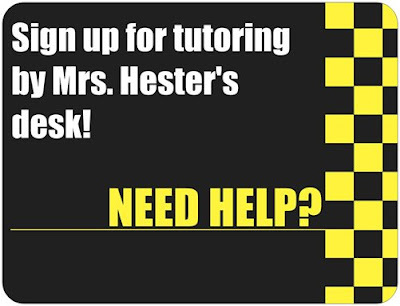 It also helps them remember where to sign up for a tutoring time. Next year I am going to try using Interactive Notebooks in my classroom. I am SUPER excited and cannot wait to try this out. I have been gathering lots of resources but if you have any personal experience with interactive notebooks at the secondary mathematics level I would love to hear about it! One of my dilemmas that I am pondering in my head is homework. Students must practice Algebra, and I want to often see how they are doing in their practice. I don't want to collect the notebooks daily because they need them in their possession, and I want them to work practice problems directly in their notebook, not on a separate piece of paper. Hence my little dilemma. Through my research and talking to people someone mentioned (I'm sorry I can't remember exactly who. If this was your idea please let me know, I'd love to give you credit!) spot checking key problems in the notebooks while students work on a brain booster/warm up activity. Then when I do a formal notebook collection and check, I know exactly who had their work done completely and on time. Enter my cute little stamp. :) This should make spot checking much easier. It doesn't have a super great purpose, it's just a pen with my name on it. And it was FREE! I only had to pay about $10 in shipping for all these items. I cannot wait for them to arrive! Fun new goodies! Your blog looks great! Love the stamp idea! You'll have to let me know how that goes. I guess I'm your first follower! Welcome to the teaching blog world even though I know you've been reading them already. Great ideas. I always get those emails from VIstaprint and think I don't need that stuff. I guess I might now since I'm going to start teaching next year! Can't wait to hear how all this works out. I've been thinking about what I want the restroom procedure to be in my classroom next year. I love the idea of using a business card and using it for the entire year! I wonder if my 6th graders can keep up with it that long...even if I did a new one each quarter, it works! Thanks for sharing!